The Sephardic-haredi Shas party's delegation to Israeli President Reuven Rivlin recommended that Israeli Prime Minister Binyamin Netanyahu, who leads the Likud party, be tasked with forming the next government. Religious Affairs Minister Yitzhak Vaknin (Shas) wished Rivlin's wife Nechama a speedy recovery and said, "I think that the Netanyahu-led government did its job properly. He is worthy of continuing to run the State of Israel." Deputy Finance Minister Yitzhak Cohen (Shas) said, "From the start of the campaign, we were completely transparent and we said we recommend Binyamin Netanyahu for the next Knesset's prime minister. We believe Netanyahu can lead the country as he has previously, so our recommendation is to task Binyamin Netanyahu with the formation of the next government. We hope that this will bring Israel only good." Shas MK Meshulam Nahari told Rivlin: "We recommend Binyamin Netanyahu for Prime MInister. That was our message before the elections. This last term was good and we want to continue on the same path, and therefore we recommend Netanyahu for Prime Minister." Shas MK Yakov Margi echoed Nahari's words: "We've been through a difficult election, and it's behind us now. We have one nation and one state. We want the work done in the previous government to continue along the same lines, and like we said during the elections, we recommend Netanyahu for Prime Minister." "Is your recommendation conditional on the next government working along the same lines the previous government did?" Rivlin asked the MKs. "The previous government emphasized retaining the status quo on issues rife with conflict," Vaknin answered. "We will not help another government which will harm that which is holy to Israel, such as Shabbat (the Sabbath), which is important for the unity of Israel." 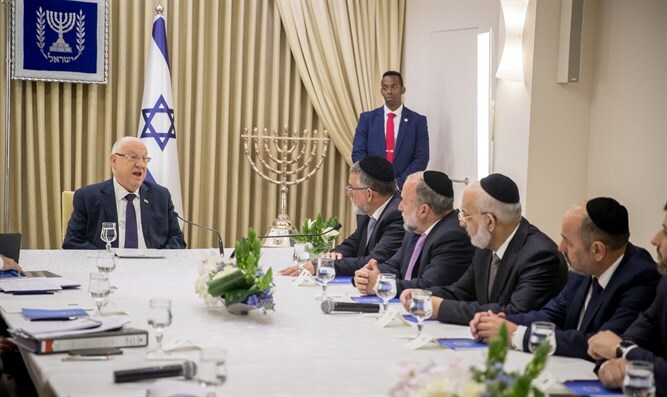 At the end of the meeting, Rivlin noted that 44 of the required 61 MKs have recommended Netanyahu continue as Prime Minister. "On Wednesday afternoon, I will decide who to task with forming the government," Rivlin said.